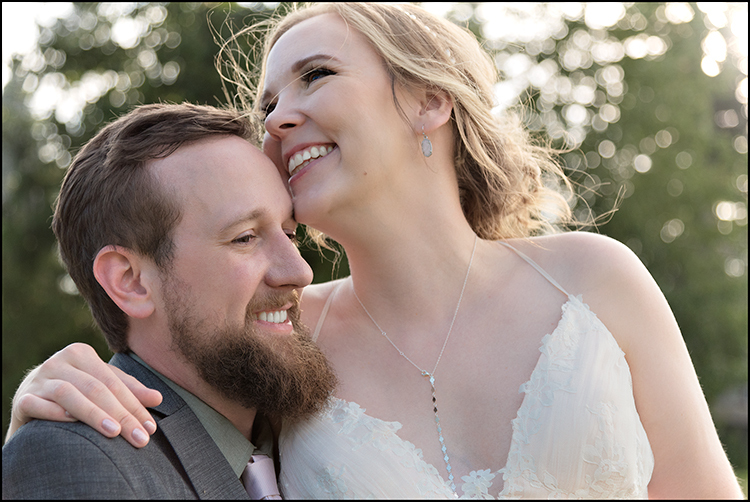 Maia married her Ben at Cooper Spur Resort on a bright hot August day. For those of you from other parts, Cooper Spur is a rustic resort on the northern flanks of Mt. Hood… the drive out is completely Oregon whether you come over the mountain or up from the Columbia River Gorge. The guests spent the weekend here… soaking in that relaxing pace. When we drove up, the first ambassador was a pint sized youngster with a pixie face… she ushered me in to meet Maia’s parents. 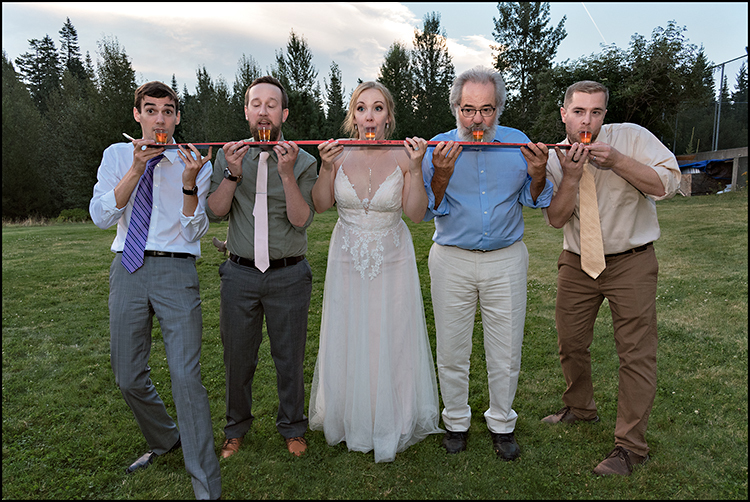 It was a great start to a perfectly Oregon wedding! 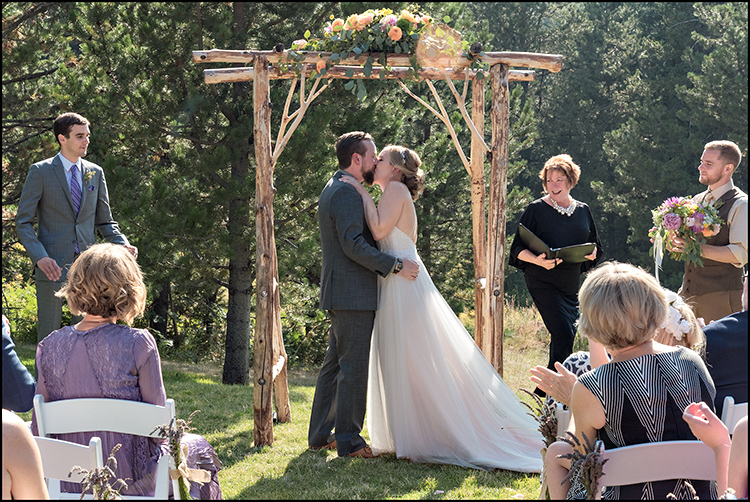 Over the next hour or so, you could see people heading to their cabins to clean up and change into their party clothes… DJ Dan Moe was setting up for the ceremony and our intrepid officiant, Melissa Coe was out under the trees doing a mic check. The ceremony was a marvelous prelude to the party… when everyone walked back to the big lawn, they found all sorts of things to do! Among other things was a DIY photo booth, complete with a selfie stick. You could order a Moscow Mule at the bar and watch a few rounds of Giant Jenga. There were flip flops for anyone tired of shoes. There was a pair of old wooden skis to sign in lieu of a guest book… coloring book and bubbles for the littles. And in one corner of the tent, a table was set for making your own S’Mores… a perfect way to wind down in that twilight of mountain air. 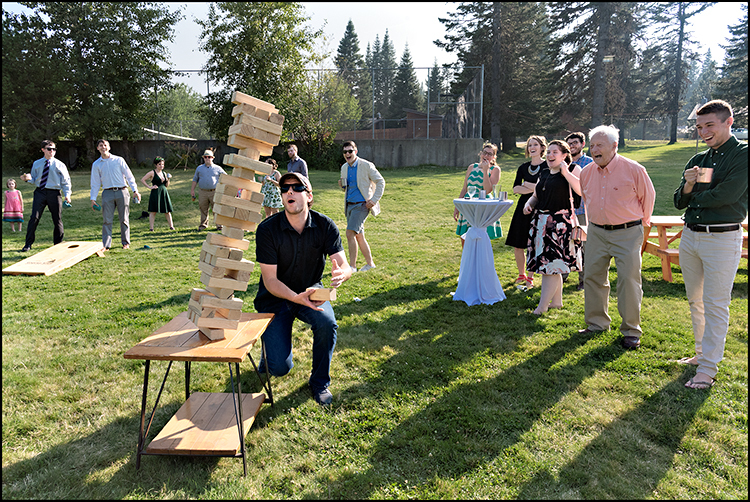 This entry was posted in Wedding Posts and tagged august day, Cooper Spur, diy wedding ideas, flip flops, Giant Jenga, Melissa Coe Ceremonies, Moscow Mule, Mt. Hood, Oregon Weddings, party clothes, Photo Booth on January 10, 2018 by admin. Oregon is a paradise for August weddings… it’s a golden time of year, here. In central Oregon, it is doubly so. Amanda and Hansford got married at the Crag Rat Hut just outside of Parkdale. It’s not a fancy place but it has a very cool vibe dating from the 1920’s and is perfect for any adventurous outdoor types. These two had a close set of family and friends join them for the afternoon and Mt. Hood was right there to enjoy their party, too. We watched the light changing on the mountain all through the day… it made for a very elegant backdrop. In August weddings, the best light is a little after dinner so we trekked down the hill after a grand feast and after pie… a great excuse to stretch a bit after all that food. In the process we took about 20 minutes of sweet portraits in that golden light and they got to have a little time to themselves out of my earshot. I think it’s pretty important that all couples get a little time out of the crowd and out of my hearing to just marvel at the day… it’s a very sweet and personal time. Maybe it’s the lemur in me for posting this on a chilly Spring day but I wouldn’t have missed this one for the world! 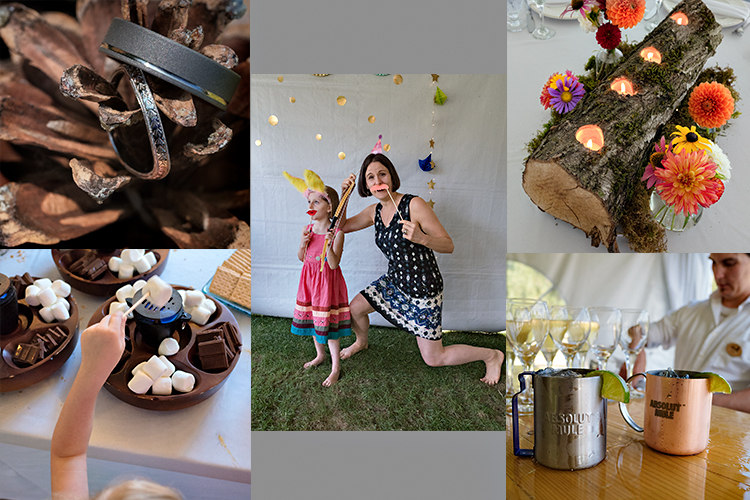 This entry was posted in Wedding Posts, Weekly Favorites and tagged adventurous, August weddings in Oregon, best Portland wedding photographer, Crag Rats Hut, golden light, Mt. Hood, paradise in Oregon, pie, wedding portraits on April 5, 2016 by admin.